'I took my hands off your eyes too soon' by Ryan Gander places two similar images of a Kiev MC Arsat lens side by side. 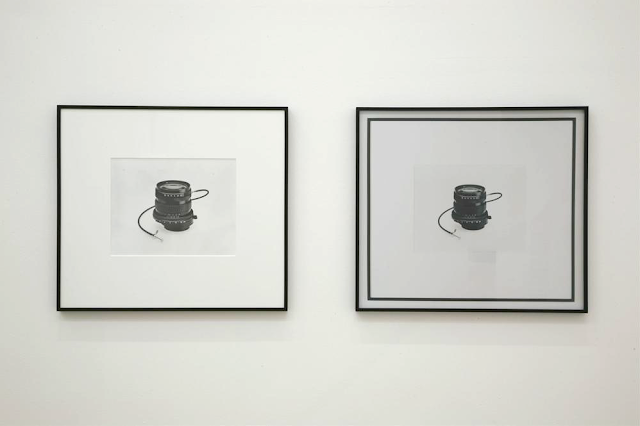 One of the photographs (the 'original') was taken by the American conceptual artist Christopher Williams as an inquiry into the act of looking and indexical nature of photography. After purchasing the artwork Gander re-photographed it and placed his image in an identical frame and displayed it alongside the the original. Appropriating the image in this way asks us to look again at the lens, and perhaps reconsider ideas of authenticity and reproduction. As the work questions ideas of awareness of looking, Gander also puts himself in the position of being the creator of both artworks and therefore adopts the legacy of Williams conceptual work.